The Trump administration launched an unprecedented assault on the transgender community last week. Some fear that policy changes could legally define trans people out of existence, threatening access to health care, education and equal rights. That’s a frightening prospect for the LGBTQ community, but you can take action right now to make a big difference. Here are seven simple ways to stand up for your trans friends and family. You may be tired of hearing exhortations to vote at this point, but if you are legally able to cast a ballot, it really does make a difference. You can look for trans-friendly candidates who have vowed to take steps to protect the LGBTQ community if they’re elected. Thanks to groups like Trans United, you can also locate transgender candidates across the country — from Texas to Vermont. Those best qualified to work on trans issues are trans people themselves. And if you live in Massachusetts, you have an opportunity to vote on Question 3, which will uphold an anti-discrimination law with a yes vote, or overturn it with a no vote. 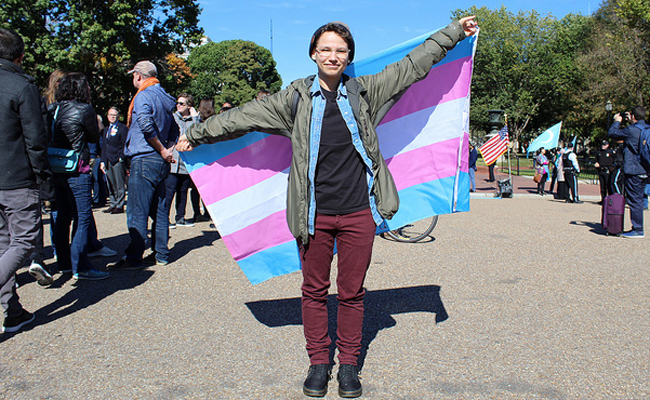 Groups like the National Center for Transgender Equality, Trans Lifeline, the Sylvia Rivera Law Project, the Transgender Law Center, Tranzmission Prison Project, the Lorena Borjas Community Fund and Lambda Legal are defending the rights of trans people across the U.S. Your employer may offer matching donations, and some philanthropists are offering to match donations as well. Check out Twitter and other social media outlets to find people offering to match documented donations so you can double — or even triple — your money. And also consider donating directly to trans crowdfunding projects. Direct cash transfers are an incredibly helpful way for low-income people to gain autonomy and better control over their lives. Transgender people, especially those of color, are disproportionately low income. Trans people may be crowdfunding for help with transition costs, expenses associated with moving, changing over their identification and many other needs. Your local and state officials have some leeway when it comes to proactively defending trans civil rights. Reach out to local officials about passing nondiscrimination ordinances and affirming the trans community. And that doesn’t just mean your elected officials. Your school board, hospital board and other community organizations can make or break living conditions for trans people in your town or city. Does your hospital or clinic have inclusive policies and train trans-competent providers? Do the schools in your district know that trans students should use the bathrooms that match their gender? Congress is about to turn over, but there’s still time — and after the election, you can target newly-elected officials to let them know you have expectations. Federal elected officials have an opportunity to challenge the Trump administration’s proposed policy changes, but they need to hear from voters. When the federal government wants to enact a regulation, officials must publish it in the Federal Register and give the people a chance to comment on it. If you don’t want to sift through the Federal Register on a regular basis, sign up for a trans action newsletter or keep an eye on Care2 for news about recently introduced regulations. If you can, come up with an original comment rather than using a template. It doesn’t have to be elaborate or feature a ton of research: Just tell the government how you feel about proposals. Transgender people face an extremely high risk of employment discrimination, from refusals to hire to tolerance for harassment in the office. Be an ally in the workplace with tools like this guide on pushing Human Resources to enact trans-friendly policies and procedures. If your workplace has a diversity and inclusion team, ask about joining it, in addition to supporting employee resource groups for LGBTQ people. If you work for a company that makes political donations, ask which candidates your employers are supporting. Are they giving money to transphobic candidates and ballot measures? If you have a 401(k) or other retirement plan, ask for information about where funds are invested so you can determine whether your retirement is partially funded by transphobia. Trans people have exploded into public life in recent years, but many people still don’t really understand them — and with that lack of knowledge sometimes comes fear and hate. Educate yourself about trans issues, and gently spread the word through your community. One of the best ways to do that is by reading trans writers and journalists, and by circulating their work. Some examples include Katelyn Burns with Rewire.News, the only out transgender reporter on Capitol Hill; Samantha Allen at the Daily Beast; Parker Molloy at Media Matters for America; Meredith Talusan at them. ; Lucy Diavalo at Teen Vogue; and Tyler Ford at them. Let's help these humans too.